Among the Commodore news from the Summer CES 1984 was the renaming of the C=264 to Plus/4. This renaming came along with a slight change in the built-in software: you could not choose between many different programs anymore, but each Plus/4 was delivered with the 3-plus-1 software. The built-in software is not worth the silicon it is etched in: a word processor (only with 40 columns and can manage documents with only 99 lines of 77 columns), a very small spreadsheet (only 17 columns and 50 lines), a poor graph generator program (which can graphically display data from the sheets, but only in text mode) and a small database (999 records with 17 fields each and only 38 characters by field). Most of these programs can only be used with a floppy drive. 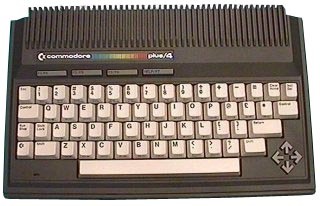 The Plus/4 can use some of the peripherals of the C=64 or the VIC-20, like the famous MPS-801 dot-matrix printer and the 1541 Disk Drive run well with it but it can't use C=64 programs (unfortunately, it cannot use the same joysticks & Datasette as the C=64/VIC-20). This machine wasn't built to be a competitor of the C=64, but it wasn�t meant to replace it either. It has an improved BASIC compared to the C=64�s, this one features graphic and sound instructions and a built-in assembler, but has lost lots of interesting C-64 features like great sound chip (SID: Sound Interface Device) or hardware sprites. The Commodore Plus/4 was an error in the Commodore marketing policy and had no success. see more Commodore PLUS 4 - C232/264/364 Ebay auctions !